Accueil Produits Musiques La bande originale de “Les Indestructibles 2”. La bande originale de “Les Indestructibles 2”. Sortie : 29 juin 2018. Label : Les Indestructibles 2. 3. Consider Yourselves Undermined ! 4. A Matter of Perception. 5. Diggin’ the New Digs. 6. This Ain’t My Super-Suit ? 12. Searching for a Screenslaver. 17. A Dash of Reality. 20. A Bridge Too Parr. 21. Together Forever and Deavor. 22. Elastigirl’s Got a Plane to Catch. 23. Looks Like I Picked the Wrong Week to Quit Oxygen. 25. Out and a Bout. 27. 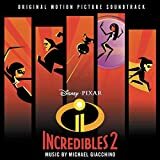 Here Comes Elastigirl – Elastigirl’s Theme. 28. Chill or Be Chilled – Frozone’s Theme. 29. Pow ! Pow ! Pow ! – Mr. Incredible’s Theme. 31. Chad Tonight Talk Show Theme. 32. Chad Tonight Newscast Bumper.